If you’ve enjoyed a day at Southern California beaches anytime over the past 10 years, take a moment to thank Kirsten James. 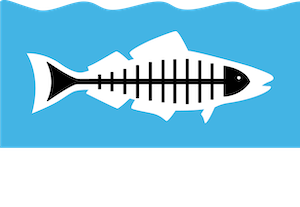 Kirsten has been Heal the Bay’s clean water watchdog for nearly a decade, most recently serving as our co-Science and Policy Director. During her tenure, beach water quality has steadily improved, with 93% of L.A. County beaches now getting A or B grades in our last annual report. Ever humble, she’d probably attribute the cleaner waters to drought and less urban runoff, but Kirsten and her team should take a lot of the credit. Kirsten has now decided to take the next step in her professional career by exiting Heal the Bay to join the Boston-based nonprofit Ceres. She will develop a West Coast water program for the group, which catalyzes major industries to invest in sustainable practices. Her years in the trenches of Southern California water policy will serve her new group well. Kirsten is a staunch defender of the federal Clean Water Act, standing strong in the face of many local challenges. She has played a pivotal role in ensuring that water quality standards are met in the region’s various water bodies and that dischargers are held accountable when they pollute our creeks, rivers and ocean. It’s detail-oriented and somewhat tedious work at times—testifying at dozens of Regional Water Quality Control Board meetings held in stuffy conference rooms, poring over inches-thick technical permits written in legalese, and negotiating patiently with harried bureaucrats, skeptical dischargers and partner non-profits. It takes a unique blend of personality and knowledge to be an effective advocate. Kirsten’s success has been built on a bedrock of traditional Midwestern values. As a native Missourian, she’s industrious, self-effacing and unfailingly polite. Think of her as the Girl Next Door—but with an encyclopedic grasp of arcane water quality regulations and a dogged determination to see them enforced. Securing the adoption of a more holistic MS4 stormwater permit for the greater L.A. region, which requires municipalities to treat water as a resource to be reused and recycled. Playing a lead role in drafting and implementing plastic bag bans in the City and County of Los Angeles, which served as a model for the recently enacted statewide ban. Leading the legislative charge in Sacramento to reform Prop 218, making it easier for cities to secure public funding for multi-benefit water projects. The Bay is healthier than it was a decade ago, thanks to Kirsten. So are the swimmers—and marine animals—who frolic in it. As the modest Kirsten attests, still waters run deep. Very deep. As Kirsten transitions to her new job, we asked some of her key partners to share their thoughts about her impact. 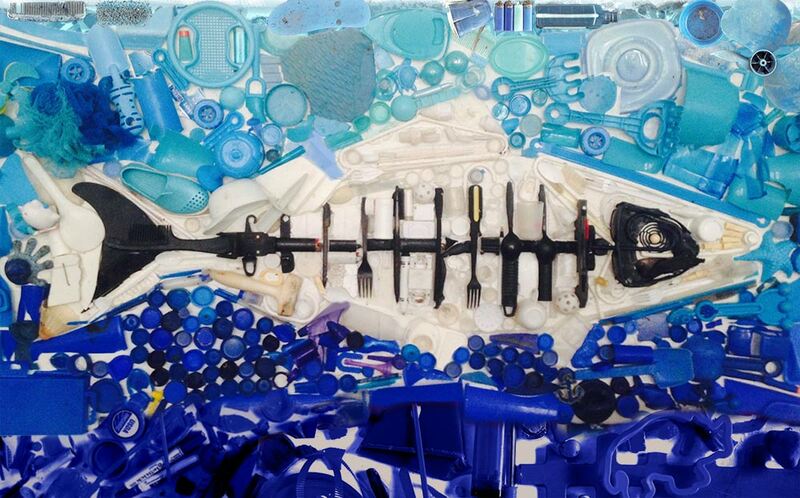 “Kirsten has been my comrade-at-arms for a decade as we’ve fought the marine debris battle. She always writes what needs to be written (no matter how complicated), and shows up at every meeting. She has pounded the halls of Sacramento even into the wee hours of the morning. She has worked harder than anyone to ensure that the environment is protected, and she has done it with a smile on her face, and her friendly hello. From our 4 a.m. flights (always working the whole time), to my hoisting her over a wall to take clandestine pictures of a nurdle factory, from utter dismay when the first state bag ban bills failed (I remember she got physically ill once, and had to take a sick day), to our zany attempts at plastic fashion wear, we have shared so much, professionally and personally. She is an invaluable colleague, and a treasured friend. “The Bureau greatly appreciates Kirsten for her tireless support of the organization, in particular the Watershed Protection Program I oversee. Working on stormwater issues with us, Kirsten is truly a champion of the environment in California and has helped protect the water resources in our entire region. Shahram Kharaghani, division manager for the L.A. Bureau of Sanitation. “From the volleyball court to the hearing room, Kirsten handles tough situations with precision and poise. I’m honored to have spent the last nine years working with her at Heal the Bay (and two years beforehand together at graduate school). She’s never met a water policy acronym that she can’t break down. Kirsten’s leadership has led to many water quality improvements throughout Southern California that will be felt for decades. We will all miss her. 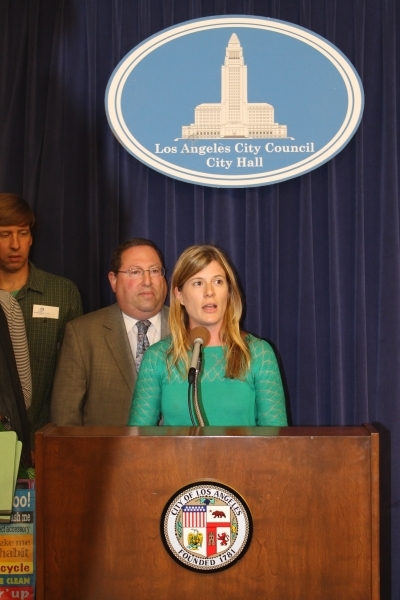 Kirsten at a City Hall press event celebrating the plastic bag ban.